With a line of successful franchises already set up, Marvel take a risk with their latest, Guardians Of The Galaxy, a largely unknown comic book property. It’s safe to say their bet has paid off, with director James Gunn delivering a ludicrously entertaining space-set adventure that fizzles with humour, rat-a-tat interplay and marvellous action set pieces. Abducted by aliens after the death of his mother, Peter Quill (Chris Pratt) is now an intergalactic scavenger, with his sights set on a mysterious orb. 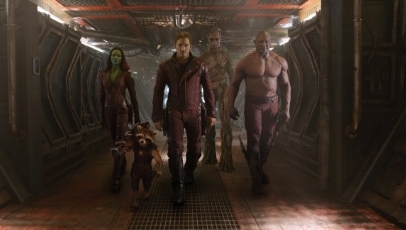 Unfortunately for him, he soon attracts the attention of Ronan the Accuser (Lee Pace), and his only hope of survival comes in the form of a motley crew of outsiders – Gamorah (Zoe Saldana), Rocket (Bradley Cooper), Groot (Vin Diesel) and Drax (Dave Bautistia). It’s a terrific, distinctive ensemble, and the CGI characters blend seamlessly with the others; it’s arguable that both Rocket and Groot are the stand-outs. Sadly, the same can’t be said for the villains, who are undefined in comparison, and the film falls foul of the same third act planetary destruction evident in all Marvel films. Information overload at the start is also an issue, but the pace settles into a better rhythm during the prison scene. For a film that presented a huge risk to a studio which has become so prominent over the years, this is a mostly successful subversion of the norm and Guardians Of The Galaxy is an absolute thrill.